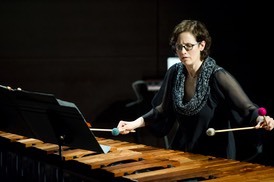 Nancy Zeltsman is a leading marimba performer, teacher, and festival director. She has premiered over 130 solo/chamber marimba works including compositions by Paul Simon, Michael Tilson Thomas, Gunther Schuller, Carla Bley, Louis Andriessen, Steven Mackey, Lyle Mays, and Robert Aldridge. Alejandro Vinao and Paul Lansky both wrote their first pieces for marimba for Nancy (which have been followed by many other works for marimba and percussion). From 1985 to 1996, Nancy was a member of the duo Marimolin with violinist Sharan Leventhal. (The duo has performed together again occasionally since 2015.) The 80 works they premiered probably stand as the largest body of pieces for marimba and another instrument. Zeltsman has presented recitals and marimba master classes across the U.S. and Europe and in China, Japan, and Mexico. Venues include the Tanglewood Festival of Contemporary Music, Zankel Hall at Carnegie Hall in New York, subscription concerts with the San Francisco Symphony, and Shenzhen Concert Hall. Zeltsman is a Professor at joint institutions Berklee College of Music and Boston Conservatory at Berklee and heads the Conservatory percussion department. She has taught marimba at both schools since 1993 in positions that were created for her, and where she created unique undergraduate and graduate courses of study focused on marimba. 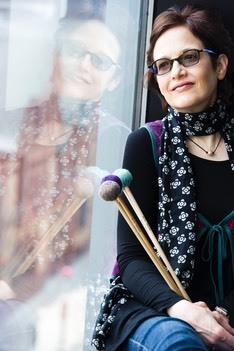 Since 2001, she has been Artistic Director of Zeltsman Marimba Festival which produces two-week seminars (ZMF) and 4 to 6-day seminars (ZMF On Tour) held in varying locations around the world (www.ZMF.us). In the fall of 2013, Nancy was appointed regular guest professor of marimba at Conservatorium van Amsterdam where she teaches two weeks each year. Her method book, "Four Mallet Marimba Playing: A Musical Approach for All Levels" (Hal Leonard Corporation) is widely used. She edited "Intermediate Masterworks for Marimba": 24 marimba solos presented in two volumes, commissioned through ZMF with support from over 200 contributors (C.F. Peters Corporation). She was a jury member for the Tromp International Percussion Competition in Eindhoven, the Netherlands in 2010, 2012, 2014 and 2016. Recordings include three solo CDs ("Woodcuts," "See Ya Thursday" and "Sweet Song"); three CDs with Marimolin ("Marimolin," "Phantasmata," and "Combo Platter"); William Thomas McKinley's marimba concerto recorded with Boston Modern Orchestra Project; and a duo marimba CD with Jack Van Geem ("Pedro and Olga Learn to Dance"). Several videos are on YouTube (Messiaen, Michalek, Levitan, Bernstein).